When it comes to wrapping trees and scattering the foliage with LED Christmas light sets, most people, ourselves included, use 5 mm Wide Angle Conical light set. 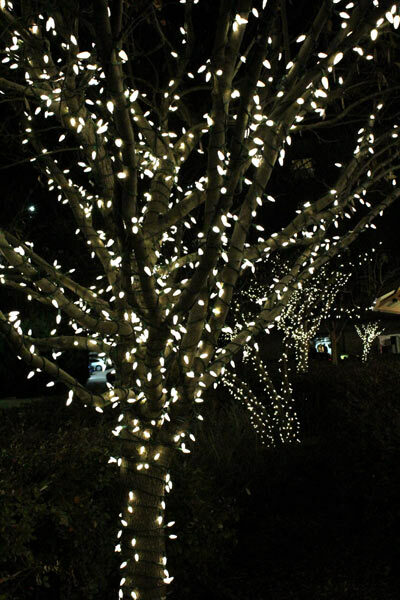 Conicals are by far the most popular LED set we sell and look great for foliage lighting. We also see a number of people going with M5 light sets, which have a similar shape as an incandescent mini light, but the illumination isn't as intense as the Conicals. Then there's the light sets that are used for perimeter lighting. C7 and C9s are the dominant bulb design found in this type of lighting application. Most people feel that the bigger the bulb, the better the look, and for the most part this is correct when it comes to perimeter lighting. Then there's the C6 LED light set, the lonely C6 is a bit of an outcast. It's often considered too large for foliage lighting and too small for perimeter lighting. It just doesn't seem to fit in anywhere. The C6 has discovered the painful truth; when it comes to LED Christmas lights, size does matter. Or does it? Let's take a closer look at this poor outcast that hasn't received the attention it deserves. Since we began making the switch to LED Christmas lights for our own installations back in 2004, we have been big fans of C6 light sets for artificial Christmas trees, wreaths and garlands. They look great in the foliage of all types of greenery. But it wasn't until recently that we began using these for outdoor foliage applications such as trunk wraps, hedge scatter and canopy lighting. The resulting look is very impressive. It may not have the pinpoint intensity that a Conical has, however, it does offer a larger illuminated surface area and looks great from any angle. C6 LED Christmas lights used for trunk wraps at the Gaylord Texan. 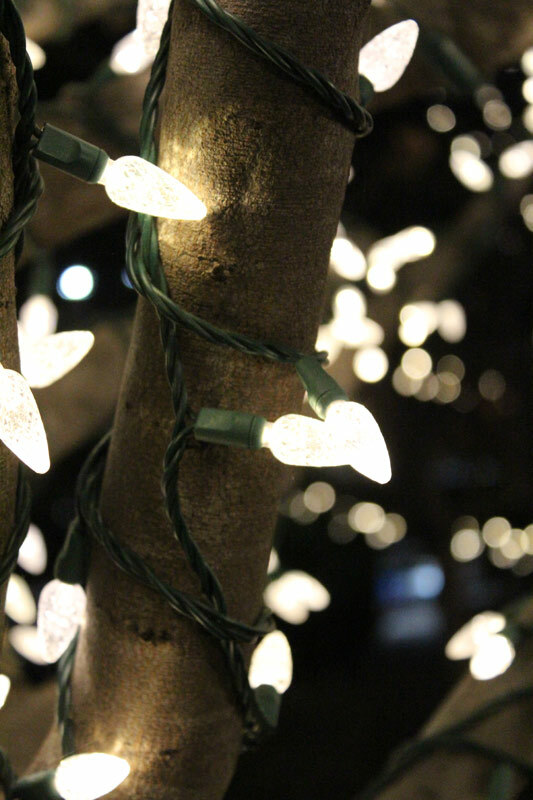 Closeup of C6 LED Christmas lights wrapped around the trunk of a tree. What about using C6 LED Christmas lights on perimeter lighting? Actually it's a great choice for that as well. Yes, the bulbs are a lot smaller than the more popular C9 lights that many people use for building perimeter applications, but as long as the correct clip is used, the closer spacing on a C6 stringer set will create very clean, crisp lines along the perimeter of a home or business. However, the proper clip selection is critical, otherwise the bulbs will not stay straight, significantly reducing the impact of the final project . Let's take a look at a couple of clip options for C6 LEDs. C6 LED lights used with LiteClip Strips on the perimeter of a home. LiteClip Strips are often used by professional installers and can be a big help in speeding up year after year installations. The strip itself is permanently attached to the surface and then you simply snap on whatever type of clip is required for your lights. In the image above, we are using clips designed for stringer light sets, but there are also clips for C7 and C9 light line. Once you have the strips up, you'll have a wide range of options available for future lighting. C6 LED Christmas light sets installed using LED All In One Clips. Easy to install option for asphalt shingle roofs. 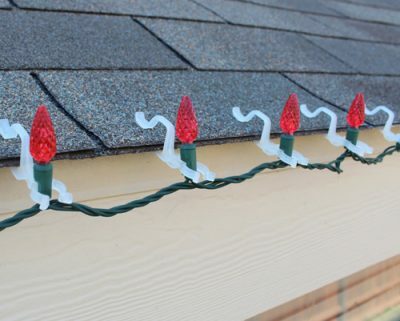 All In One Clips are a great choice when it comes to firmly holding C6 LED Christmas lights. These clips work well on standard asphalt shingles as well as gutters. It's very important to use one clip for every bulb in order to maintain a clean, straight appearance. One word of caution, while these clips do work well, the sets sometimes tend to slip out of the cutaway that is supposed to hold them. A small drop of superglue to help hold the light set in place on the clip does help. As long as you minimize the amount of superglue, you'll still be able to separate the clip from the light set in the event you need to replace the clip in the future. There are other clips that can be used with stringer sets, but they are designed to clip on the cord and not on the socket itself. As a result, you will not have the straight perimeter lines that can be achieved by using one of the two clips mentioned above. 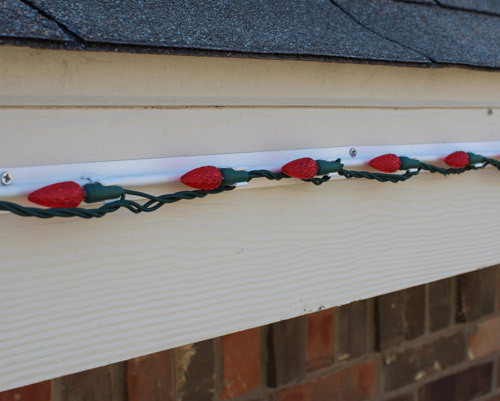 But if you are okay with a randomly strung perimeter light set and having bulbs not line up isn't an issue, then you can use an Icicle Light Clip or an S Style Gutter Hook. 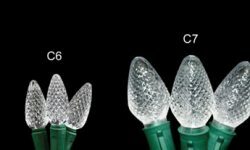 So despite being underestimated and overlooked for years, the mighty C6 is starting to make it's mark within the Christmas lighting industry. More and more people are finding out that this small, unassuming bulb has a lot to offer. Whether it's used for wrapping, scattering through the foliage of trees and bushes, or along the perimeter of a building, the C6 is a great choice that allows maximum flexibility and great eye appeal. Also, don't forget to try it out on indoor Christmas trees, wreaths and garlands.